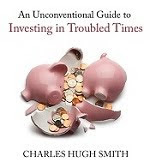 oftwominds-Charles Hugh Smith: Has Housing (Finally) Become an Attractive Investment? Has Housing (Finally) Become an Attractive Investment? According to cheerleaders, housing supposedly bottomed in 2008, 2009, 2010 and 2011; is it finally an attractive investment, or just another knife that's still falling? In a previous report, Headwinds for Housing, I examined structural reasons why the much-anticipated recovery in housing valuations and sales has failed to materialize. In Searching for the Bottom in Home Prices, I addressed the Washington and Federal Reserve policies that have attempted to boost the housing market. Superficially, housing looks potentially attractive as an investment. Mortgage rates are at historic lows, prices have declined about one-third from the bubble top (and even more in some markets), and alternative investments, such as Treasury bonds, are paying such low returns that when inflation is factored in, they're essentially negative. If either of these conditions deteriorates -- that is, if government support of the housing/mortgage markets declines due to the rising pressure to trim fiscal deficits, and private demand does not appear to replace it -- then the forecast of steadily improving markets weakens. Common sense suggests that the pressure to trim unprecedented (in peacetime) Federal deficits -- roughly 8%-10% of the nation’s gross domestic product (GDP) for four years running -- will eventually impact all government spending, including transfers and housing/mortgage subsidies. Though the general assumption is that the Fed can engineer super-low rates essentially forever, investors should be wary of assuming that an omnipotent Fed can control the mortgage market. The Fed only sets the Fed Funds rate; it does not directly set mortgage rates. Its only other lever over mortgages is direct purchases of mortgages and mortgage-backed securities in order to prop up the market, and many observers believe there are now political limits on what the Fed can do. In other words, the Fed could theoretically buy another $1 trillion of mortgages on top of the $1 trillion it already owns, but the unprecedented expansion of the Fed’s balance sheet is already drawing criticism. Too often, when buying real estate for its income-generating potential, small investors make costly underestimations or miscalculations that materially handicap the returns on their invested capital. In this type of sector, being forewarned is forearmed. This entry was previously published on chrismartenson.com. Thank you, Venkatesh P. ($60), for your astonishingly generous subscription to this site -- I am greatly honored by your steadfast support and readership. Thank you, Gunnar A. ($50), for your remarkably generous contribution to this site -- I am greatly honored by your continuing support and readership.